Brunei Darussalam, Thailand, Malawi, Kosovo, India, Uzbekistan, Zambia, Nigeria, Djibouti and El Salvador were the most improved economies in 2016/17 in areas tracked by Doing Business. Together, these 10 top improvers implemented 53 regulatory reforms making it easier to do business. Economies in all regions are implementing reforms easing the process of doing business, but Europe and Central Asia continues to be the region with the highest share of economies implementing at least one reform—79% of economies in the region have implemented at least one business regulatory reform, followed by South Asia and Sub-Saharan Africa. The report features four case studies in the areas of starting a business, dealing with construction permits, registering property and resolving insolvency, as well as an annex on labor market regulation. See all case studies. one of the mechanisms through which business regulation can impact employment directly is the simplification of business start-up regulations. 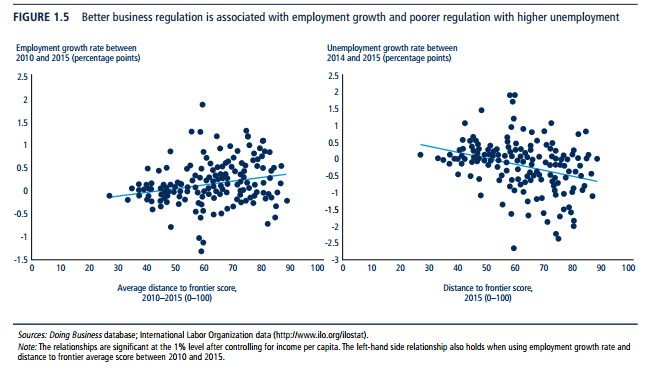 Across economies there is a significant positive association between employment growth and the distance to frontier score (figure 1.5).1While this result shows an association, and cannot be interpreted in a causal fashion, it is reassuring to see that economies with better business regulation, as measured by Doing Business, also tend to be the economies that are creating more job opportunities. When it comes to unemployment, the expected opposite result is evident. Economies with less streamlined business regulation are those with higher levels of unemployment on average. In fact, a one-point improvement in the distance to frontier score is associated with a 0.02 percentage point decline in unemployment growth rate. …The data support this interpretation as there is a strong association between inequality, poverty and business regulation. In fact, economies with better business regulation have lower levels of poverty on average. Indeed, a 10 percentage point improvement in the distance to frontier is associated with a 2 percentage point reduction in the poverty rate, measured as the percentage of people earning less than $1.90 a day. Fragility is also a factor linked to poverty. However, even fragile economies can improve in areas that ultimately reduce poverty levels (pg. 7-8). Check out the full report. Why do gun rights advocates fight common sense reform? “Doing Business measures many different dimensions of business regulation. To combine measures with different units such as the number of days to obtain a construction permit and the number of procedures to start a business into a single score, Doing Business computes the distance to frontier score. The distance to frontier score captures the gap between an economy’s current performance and the best practice across the entire sample of 41 indicators across 10 Doing Business indicator sets. For example, according to the Doing Business database across all economies and over time, the least time to start a business is 0.5 days while in the worst 5% of cases it takes more than 100 days to incorporate a company. Half a day is, therefore, considered the frontier of best performance, while 100 days is the worst. Higher distance to frontier scores show absolute better ease of doing business (as the frontier is set at 100 percentage points), while lower scores show absolute poorer ease of doing business (the worst performance is set at 0 percentage points). The percentage point distance to frontier scores of an economy on different indicators are averaged to obtain an overall distance to frontier score” (pg. 5).